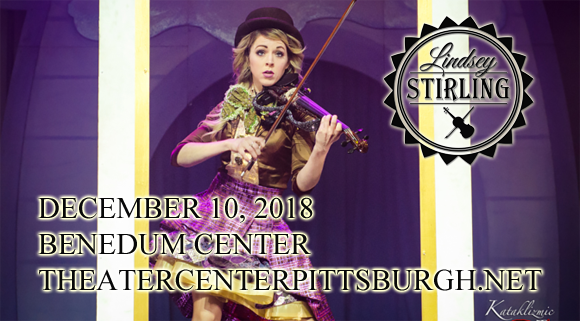 Fresh from her summer-long stint on a co-headlining tour with Evanescence, genre-defying dancer and violinist extraordinaire Lindsey Stirling comes to Benedum Center on Monday 10th December 2018! The uniquely talented artist brings her theatrical, holiday-themed Winter Wanderland tour to the stage, performing covers of Christmas classics, including "I Wonder as I Wander," "We Three Gentlemen (Medley)," "Santa Baby," the theme from "Home Alone" and "Hallelujah"! Stirling is a one-of-a-kind entertainer who leaves any audience utterly enchanted! American violinist, dancer, performance artist, and composer Lindsey Stirling first drew public attention in 2010 as a quarter-finalist on the fifth season of the televised talent competition America's Got Talent. Fusing the genres of hip hop, pop, classical and dubstep with expressive dance, Stirling created a unique performance style. After leaving the show, she created a YouTube channel and began to develop a worldwide fan base on the strength of her videos. To date, the channel has over 1.7 billion total views and over 10 million subscribers. After signing a deal with Lady Gaga's manager, her self-titled debut studio album was released in 2013 and by the end of the year, Stirling was the second best-selling artist on the Classical Crossover charts. Stirling's second studio album, Shatter Me, was released in 2014 and peaked at number two on the Billboard 200, whilst simultaneously reaching number one on three other Billboard charts. To date, she has released four studio albums, her most recent being the Christmas album Warmer in the Winter (2018).